This week's Bloomex product of the week is our Signature Arrangement basket. This elegant arrangement pops with the faded colours of fall, yet retains a certain bright shine to it, making it the perfect intersection between rustic and chic. The Signature Arrangement is one of Bloomex's most beloved basket arrangements from its customers. Ordering it, you can expect an assortmant of Chrysanthememums, Gerbera Daisies, Lilies and Sunflowers, adorend with greenery and filler based on the fall season. 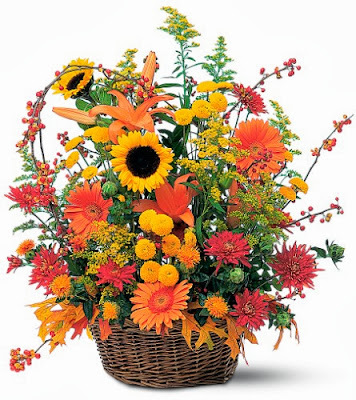 With an array of yellows, oranges and reds, this vibrant basket is available at an unbeatable price and is sure to bring a smile to the recipients face, brightening up any room its in with the joy of autumn colours. Ideal for: "Thinking of you," Halloween, Thanksgiving, Just Because.